This newly renovated Charming Cottage sits one minute from First Beach (one of three beaches you can access) at Lake Hayward located in scenic East Haddam CT just over the Colchester town line. Sit and enjoy your morning coffee on the sprawling 'L' shaped front porch that has a small view of the lake, sleeping area (daybed) with dresser, sitting area and dining area which seats 7 or 8. The huge living room has a fireplace with candles for ambiance, a sleeper sofa, a desk, a sitting area and TV with cable. The master bedroom has a queen bed, dresser, nightstand and closet. Another bedroom has 2 twin beds, dresser, nightstand and closet. The kitchen comes complete with everything you need to prepare, cook and eat a meal (except the food!) The back yard is great for frolicking and has a gas grill, table, umbrella and chairs. Come and get away to beautiful Lake Hayward! We have owned at Lake Hayward since 2000. We loved raising our children at the lake every summer. Now we have added this rental property right next to our own cottage to share the joys that Lake Hayward has to offer! The property has a very unique 'L' shaped front porch with relaxing views. It also has a huge living room for all to gather in. The added benefit of being in a few minutes walking distance to the beach is great! The association puts on many social functions for children and adults throughout the summer that are so much fun! Shower, toilet & sink. Hair dryer and makeup mirror. Renters need to provide their own bathing towels, soaps and shampoo. There is a small view of the lake from the front porch. Large wall AC unit located in the living room which cools the whole cottage. There is a propane heater located in the living room that can be used for the months of September and October. Using heat is not included in the rental price so an additional charge will be applied. All sheets, blankets, comforters, pillows, & pillow cases are provided for all beds, pull out sofa and day bed. Renters need to provide their own bathing and beach towels. Normal size refrigerator with freezer on top. Electric stove with oven. Four burners. We have glasses, plates and silverware for at least 8 people. There are pots, pan, cookie sheets, serving bowls, serving utensils. There is also a blender. The dining tables are located on the huge 'L' shaped front porch. there is one table that seats five and one table that seats three. Novels of many genres. Books for children as well! Lots of Board Games for all ages. Cards. Huge chalk board and chalk on the front porch for artists of all ages! Beach toys in the closet on the front porch along with 2 beach chairs, med size cooler and beach blanket. Many movie genres available. Some kid-friendly. Some TV shows. Patio directly outside the back door with an open outdoor shower. Two tennis courts across from the beach. Walking distance is three minutes from the cottage. Chantaclair public golf course located in Colchester about a fifteen minute drive. We really enjoyed our short but relaxing stay at this cottage. It was clean, comfortable and well kept. Phil and Kathryn were on hand during our stay and were friendly and welcoming. We loved the front porch and found the beds comfortable. We were here to visit our son, who doesn't get much time off of school, and it was great to relax in the back yard and grill and take walks around the lake. I would've loved to have been able to spend more time and we will definitely look into renting this house again. We had a great time staying at the cottage on Lake Hayward. The house was very clean and the perfect place to come back to after a day on the lake. It was a short, but wonderful stay at this cute lakeside cottage while in the area for a horse show. Not far from stabling and the Haddam Meadows State park. Wonderful access to Hayward Lake, yet nice rural and scenic drive on back roads to get there. Great connectivity for phone and wifi. Comfortably furnished, had everything we needed, including ample hot water for showers! We strive to make our cottage your home away from home for your stay! Charming, very clean cottage, good wi-fi, well equipped kitchen (even a step stool which was good because it's built for taller people), safe, quiet area. Comfortable for 4 adults (a couple and our 22 & 27 yr old sons). 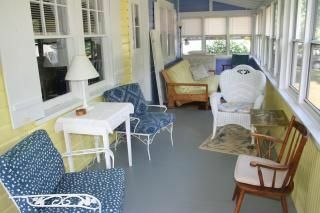 Lots of comfy places to sit and read or work, both inside and on the lovely screen porch (nice view of the lake) where we ate all our meals. Short walk down the hill to the small beach. Looks like a wonderful lake if you have a kayak or canoe. In a neighborhood of mixed year round and summer residences, close to other homes so not super private. Was quiet the weekdays we were there but the proximity to other houses made me wonder about noise levels at other times. Not much to do without driving (narrow New England road along the lake by is not conducive to walking) but some nice nearby hiking (enjoyed Devil's Hopyard and Hartland Recreation area-hard to find but well marked enjoyable trails). I'd kind of like to give this a 3.5 stars because having to supply your own towels, TP and garbage bags is unheard of in my experience with VRBO and airbnb. Have rented places from Maine to Hawaii and this is the 1st time we had to supply these items. Since we flew from the midwest for events in NYC one weekend and New Haven another, we wanted a nice place to spend a couple days in the area and this cottage fit the bill but since we flew, having to bring towels was inconvenient. Luckily we have friends in New Haven from whom we borrowed towels. If towels disappear, take that out of the damage deposit rather than make people bring their own. Kathy, the owner was very responsive and pleasant, arrangements worked out smoothly. I am so happy you enjoyed your stay in our quiet cottage location! It is peaceful on the weekends as well for the most part. We do supply a starter TP roll, paper towel roll, and garbage bag for your arrival. There are two hand towels in the kitchen and one in the bathroom along with clean sheets for all of the beds, day bed and pullout couch. As owners, we are always happy to take requests to accommodate special circumstances for any of our guests. We will always try to work something out if we can. My husband and I enjoy the four mile walk around the lake and local traffic is very aware of walkers, joggers and bikers along the road as there are many. We enjoyed our stay at this sweet cottage Oct 4th-6th. It was a get away week-end for my husband and myself for our Anniversary. The cottage in clean, nicely painted and decorated, wrap around enclosed porch and a nice back yard. The beach is just down the street. We took an amazing carriage ride around the lake provided by Allegra Farm-just up the road. We got over to see the show at Goodspeed Opera House. Great restaurants in the area. Priam winery is very close and a nice spot to visit. Summers would be great at this place with children or just a couple. There is the lake, beach, Mystic Seaport and Aquarium, Gillette Castle, Essex Train and Boat Ride and so much more. Just a a relaxed country area, people were very nice around there. As a renter you will have free access to three private beaches located along Lake Hayward. Each beach has a roped off swimming area with a raft you can swim out to and a seperate fishing area. The Property Owners Association of Lake Hayward run many different activites over the summer at the Pavillion at First Beach that you could attend if you choose such as: Kiddie Bingo, Children's Arts and Crafts, Set Back Tournament, Cribbage Tournament, Live Bands or perhaps a Pig Roast. Activities change from year to year and some require a minimal fee. Please inquire when you call to rent what activites may be available. Around the lake there are also tennis courts (1st beach), basketball court (1st beach), volleyball court (2nd beach), small playground (2nd beach) and pavillion (1st beach). The surrounding area has the following attractions: Devils Hopyard State Park (great hiking), Gillette Castle, Goodspeed Opera House, Mohegan Sun & Foxwoods Casinos, Priam Vineyards (Colchester), Salmon River State Park, Day Pond State Park, Chanticlair Golf Course (Colchester), Fox Hopyard Golf Course (East Haddam), Waterford Speed Bowl, The Dinosaur Place, Gallery Cinema (Colchester), Dodd Stadium (Norwich) Ct Tigers Baseball.